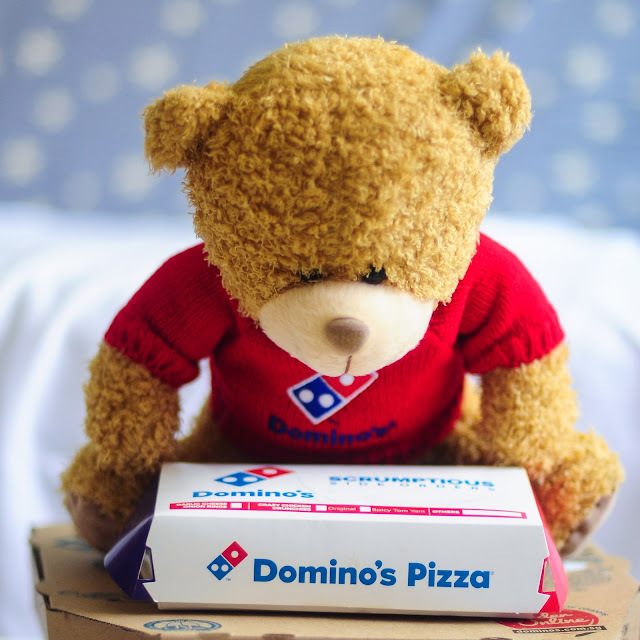 Home / dominos pizza 2016 promo code / dominos pizza may 2016 promo code / dominos pizza promo code / Domino's May 2016 Coupon Code: More than 50% OFF! If you're looking to tickle your tastebuds and satisfy your tummy this month, treat yourself to Domino's unbeatable promo deal this May 2016. The pizza deals come in three variations (regular, large or extra large) and are accompanied with their all new cheesy mozzarella sticks! 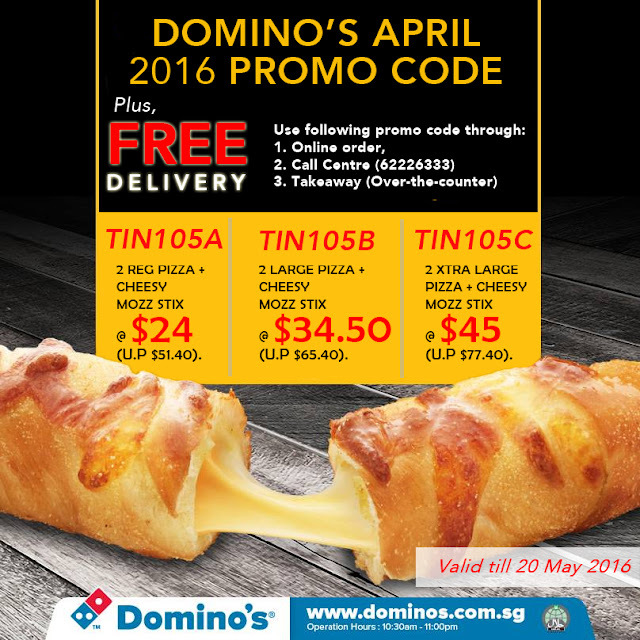 Read till the end to enjoy Domino's Pizza May 2016 promo code in Singapore. Also, stand a chance to WIN one Regular Pizza (worth $22.80)! I think Domino's Pizza needs little introduction. I think it first entered Singapore about 10 years back? I was really ecstatic because they had a policy to deliver pizzas in 15 minutes or else the delivery is FREE! 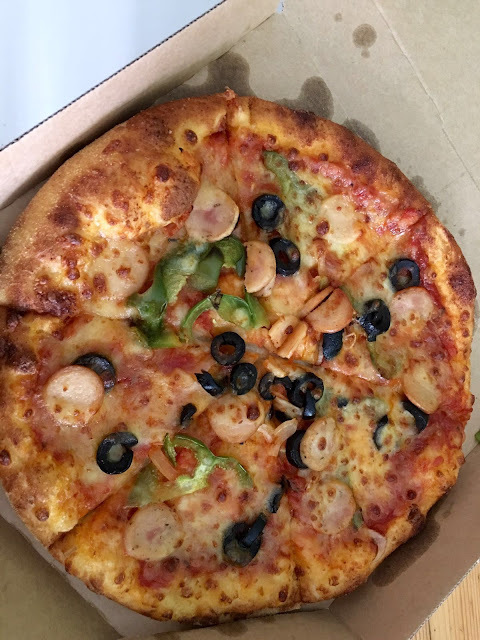 It was indeed quite a memorable experience— and now you'd be happy to know that there is a promo code which allows you to have FREE Domino's Pizza delivery! Their recently launched the Cheesy Mozzarella Stix is specially created for cheese lovers and baked to golden perfection. In fact, it is FULLY loaded with 100% Mozzarella Cheese! It's so packed full of cheese and you can see how it's bursting through its ends. Using the following promotion, I was also able to order TWO pizzas from their online store! 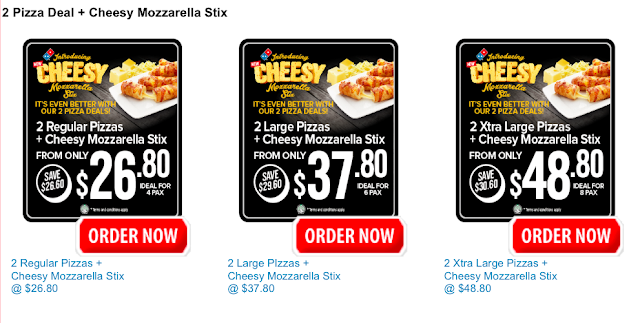 "TIN105A" : 2 Reg pizza + Cheesy Mozz Stix at $24 (U.P $51.40). "TIN105B" : 2 Large pizza + Cheesy Mozz Stix at $34.50 (U.P $65.40). Having tried all the pizzas before (except the prawn series), I love my two all-time favourites: The Big BBQ and Napolitana Chicken! When put together, these ingredients are a perfect savoury blend: succulent smoked chicken breast, green pepper, onion and BBQ sauce with mozzarella cheese! I couldn't wait to eat any longer— so I took a photo of the other pizza with my iPhone on one hand, and a pizza on the other *grins*. You won't want to miss this: the Napolitana Chicken Pizza contains Onions, Green Pepper, Riped Olives, Chicken Sausage, topped with Mozzarella Cheese on Napolitana Sauce. Get it cheaper with the Domino's Promo Code below! The above is a screenshot form Domino's website— but you can get it at much cheaper prices using the Domino's Promo codes below! Valid till 20 May 2016. Delivery is FREE.